Wow... I picked a good day to put this post up didn't I?! Despite the fact it is quite possibly the most miserable, wettest day in months outside right now, I am desperately hoping that summer is going to make a come-back! 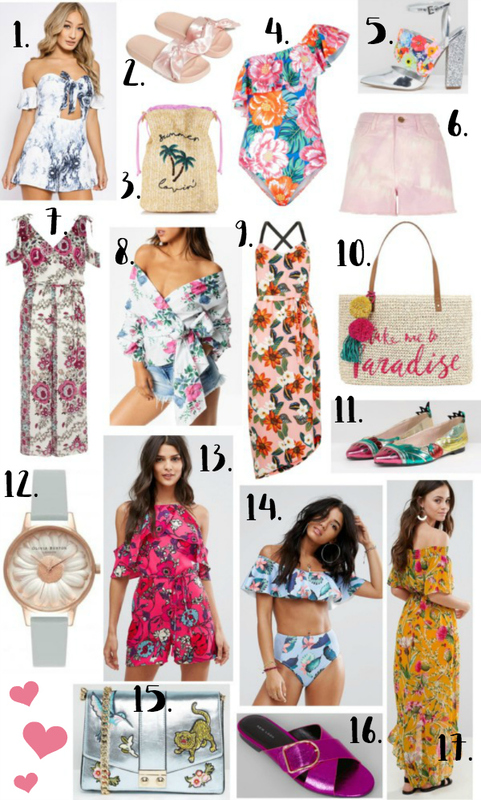 This being the case, I thought I'd put together a wishlist/fashion post on all the summery pieces I've been loving lately. This season I'm all about bright florals, maxi dresses and playsuits. There are just so many gorgeous, affordable options out there that we're spoilt for choice! Whilst I'm not jetting off away anywhere this summer (sob!) I can still appreciate the insane amount of stunning bikinis and swimsuits there are in the shops - I'm particularly a fan of the bardot and high-waisted bikinis; they just look so flattering. Accessories-wise, sliders seem to be the shoe of the summer and I'm totally on board with that. Comfy, easy to wear and available in so many different varieties (I've seen plain ones, ones with bows on, ones with super cute embellishments like these which I really hope come back in stock!) it's no wonder they are everywhere right now. I'm also loving the slogan bags and sun hats I've seen across the likes of Accessorize and Skinny Dip London - so perfect for holidays! Do any of my fashion finds take your fancy? Let me know!